Packed into a slim rack-mountable body are 48 inputs, and a total of 18 mixing buses. What's more, you can use all available functions at 96 kHz such as EQ and delay included on all inputs and outputs. Equipped with the head amps descended from those of the DM2000 and 02R96 on its analog inputs, the DM1000VCM offers an incredible sound and an overwhelming 110 dB dynamic range, thanks to its 24-bit AD/DA converter. In the digital domain, the DM1000VCM ships with the outstanding REV-X reverb algorithm introduced with the SPX2000, while VCM plug-ins like EQ, compressor, tape saturation and guitar effectors offer the warm sound of analog circuitry. This console offers outstanding performance in the production and live / sound reinforcement areas, letting you be as musical as you want without having to rely on vintage effects and outboard equipment.If surround functions that support post-production and multi-channel broadcasting are what you need, the DM1000VCM, like the DM2000 and 02R96, boasts compliance with the global THX pm3 standard for surround sound equipment, and like them it makes absolutely no compromises. In fact, as well as offering you the ability to mix and monitor in 6.1 channel surround sound, this console boasts a Bass Management processor and a wealth of dedicated surround effects. The DM1000VCM also comes equipped with iSSP technology, making the creation of realistic sound fields a snap, providing exceptional performance for its range. Featuring control functions for Digital Audio Workstations like NUENDO and CUBASE, and compatibility with Studio Manager Version 2 for both the Windows and Macintosh for seamless control of your audio systems, the DM1000VCM is a compact, powerful console that gives you all the superior usability, expand-ability and flexibility you need in a digital mixer. 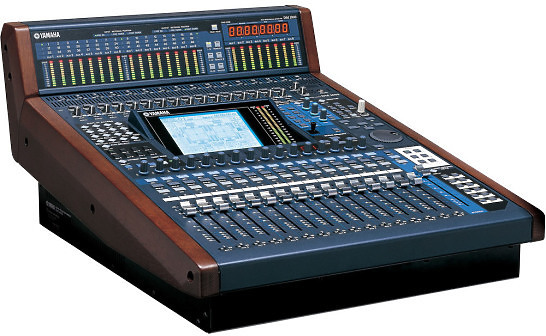 Hire the Yamaha DM1000 Mixing Desk from Procam. Best service and rental rates for the Yamaha DM1000 Mixing Desk and all cameras, lenses, sound, lighting and grip.